Tucker Dunbar uses a 3D printer to create a dog statue at the Innovation Orchard at Ganesha High School. After years of planning and in partnership with a local high school, Cal Poly Pomona’s new lab, designed as an entrepreneurial incubator to turn bright ideas into market-ready realities, is getting down to business. Cal Poly Pomona and Ganesha High School celebrated the formal grand opening of Innovation Orchard on Oct. 4. Ever since launching the university’s Student Innovation Idea Lab, or iLab, three years ago, iLab Director Olukemi Sawyerr has been looking for a place where students can take their ideas for products and businesses from the drawing board to the marketplace. She found it just two miles east of the university at Ganesha High in Pomona, where the new Innovation Orchard will also be a resource for high school students who can simultaneously earn college credit. 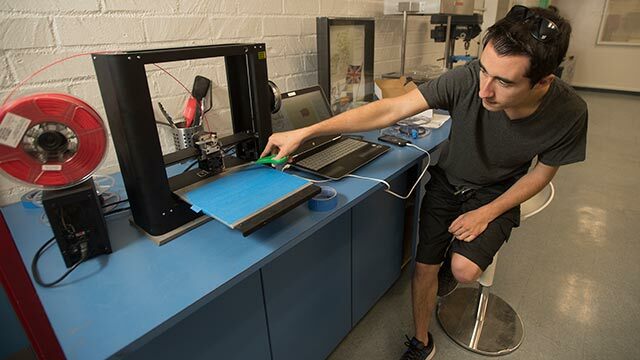 The lab is equipped with the latest design and prototyping equipment, ranging from 3-D printers, laser cutters and Computer Numerical Control (CNC) milling machines to power tools and paintbrushes. And it also houses individual spaces for students to use as offices for their ventures, as well as a conference room for meetings. Students have already fortuitously found business opportunities, said Innovation Orchard technician and junior Julia Valenti, who is studying mechanical engineering. When another department at Cal Poly Pomona noticed the plastic name badges students had made for themselves using Innovation Orchard equipment, they wanted their own, Valenti said. The students created the professional-quality nameplates at a fraction of the cost of a traditional vendor. And Valenti said that when students in the CPP kinesiology department needed a new life-size, anatomically correct human skeleton model, Tucker Dunbar, IO 3D printing specialist, assisted them in making one using a 3-D printer. But success as an entrepreneur also requires tenacity, fortitude and confidence. Since its soft opening earlier this year, students from both campuses have been making use of Innovation Orchard. Cal Poly Pomona students participated in an eight-week boot camp over the summer to further develop their startup concepts. At the end of the boot camp, investors listened to students pitch their business ideas. Several ideas attracted investors’ interests. With fall semester underway, both campuses are beginning to recruit students into the program. So far, about a dozen college students and 10 high school students have been trained to use the equipment. Sawyerr hopes it will be as successful as the iLab at Cal Poly Pomona, which served more than 1,350 students in 2017-18. Armando Cordero, a senior majoring in manufacturing engineering, is finishing up a prototype for his product idea in the Innovation Orchard. It’s a lightweight yet powerful electric scooter that folds up small enough to fit inside a standard backpack. The concept is inspired by his experience using a skateboard as a mode of transportation on campus. “I thought, ‘If I could only make something that’s easier,’ ” he said. Cordero set out to devise a solution, and the iLab and Innovation Orchard became the ideal incubator and maker space. Using a carefully considered folding structure, the latest technology in efficient electric motors, and a manufacturing process with low-cost mass production in mind, Cordero is putting the finishing touches on his design. Innovation Orchard is deeply rooted in collaboration. Ganesha provides the space and the high school instruction, while Cal Poly Pomona provides the crucial equipment and furniture, as well as college-level teaching. High school seniors taking part in the program earn college credits, according to Ganesha teacher and career technical education instructor Jacqueline Jones. The high school participants meet once a week with their college counterparts for a joint lecture or presentation, Ganesha student Nathan Cruz said. He plans to study computer science in college. Ganesha student Vicente Carrillo said he has given thought to becoming an entrepreneur and is working on an electronic wearable device. Through the joint class, he learns about creating and implementing ideas, as well as effectively communicating them to others, Carrillo said. It offers valuable experience in public speaking. Having an opportunity to work alongside college students is advantageous for the high school students, said Jones, who teaches accounting, multimedia technology and technology education. Sawyerr also finds value in the partnership and working together. At their core, the iLab and Innovation Orchard teach problem solving. “We want our students to be able to apply their disciplinary knowledge to real-world problems,” she said. “We want our students to understand that they have the capacity to solve the problems they see every day. Rapid advances in technology have created a vast number of thriving career fields that did not exist even just a few years ago, according to Sawyerr. Skills honed at Innovation Orchard will be valuable to the students no matter what route they ultimately take in life.